Slightly aside from my normal wine tasting tales, I have been away in Paris, so, I have been too distracted to do my usual tasting blog. Instead I have been 'checking out' some unruly tenants, sympathising with my concierge (I have learnt a lot from Muriel Barbary) and generally trying to find IKEA from the Paris Circular, or Périphérique as it is known, painting, dusting, cleaning, scrubbing, checking in new tenants and finally, returning to the calm and tranquillity of Bath. The family home makes me feel melancholy, with echoes of footsteps on the hall floor and only a buzz of traffic and people; maybe it is because of returning to Paris, which brings back memories of Dominique and our lost promises; maybe because it is still haunted by laughter and voices of yesteryear when we were a whole family and life was seen through the youthful tints of rose and sepia; maybe it is because I miss my father, who has extended his travels in the Southern Hemisphere for another couple of months (I like his style, but I would like a retirement fund like his much more); or, maybe it is just the weather and the news that Patrick Swayze and Keith Floyd have died. Now don’t get me wrong, I am not, nor ever was a Patrick Swayze fan. No! He sparked up quite a few jealous flares when I was dating the girlfriends of the time. Constant chatter on double dates (take it from me, double dating is a bad move) of how ‘gorgeous’ he was, whilst we, the boys would sit and grumble in the corner of the bar listening to the trills, the ‘oohs’ and ‘aahs’ and wondering when we would get a ‘look in’ (I think that was when I made the decision to take my dates to scarier films so that I could get the girl in my arms at the crucial moments). I was too young, thankfully, for Dirty Dancing but not for Ghost, so never had to consider my dance moves, only my artistic side. 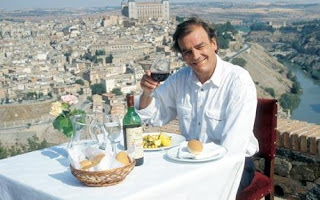 However, I was a Keith Floyd fan. I loved the way he cooked, chaos with a flare, going from failure to failure with enthusiasm, to paraphrase Churchill. I loved the fact that he was a Somerset boy like myself, which in my youth was a factor more so than today. Presentation was not as important as the sensations that came from flavours, something I am mostly in agreement with now, though debates on 'feasts for the eyes' can run and run. His love of all things French was a healthy part of my decision to go to France to learn about food and wine, as he did, and with that, life and love. I ended up in Paris rather than the south, firstly poor and hungry, but later, with plenty of friends and eventually the love of my life. Story book stuff really, and it is partially thanks to him. Inspired to learn, my first wine lesson was over a ropey Beaujolais, light in colour with cherries and a chewing gum flavour that I later learnt came from the carbonic maceration for which Beaujolais is famous. From there I progressed to other grape varieties, and then other wine producing countries. I did a wine course before working in a Parisian café bar (serving beer and more ropey wine, notably Morgan, and learning very quickly and from scratch how to cook as the owner demanded more from me). It was through his inspiration that I read Elizabeth David, then Jane Grigson and the wider food writing community (I should say Julia Child given the film of the moment but I haven’t seen it and do not own her books), getting inspired by them too. Setting higher, and more chaotic standards for myself (I still love the chicken with leeks and cream recipe), and once, though thankfully only once, setting the kitchen of the café on fire. It is thanks to Floyd that I understood why there is genuine and real pleasure to be found in food and wine, and I honestly felt that I was following in his footsteps (not forgetting his liking for The Stranglers, his theme tune). Sadly, seeing it all crumble around him, the drink, the illness, the bankruptcies, all that too is a lesson learnt. But it is not the latter that we should remember him by but the fact that he was a gourmand, a gourmet, a bon viveur. Full of fun, energy and passion about what he did. So raise a glass to his memory as I will, and to Swayze (despite the arguments he caused), and to the fun times, the bad hair and turned up jacket sleeves; of the period that is becoming, more and more, just another decade in history.